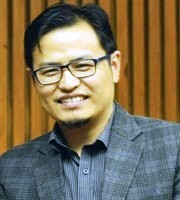 KB Veio Pou teaches in the English Department at Shaheed Bhagat Singh College, University of Delhi, and is the author of Literary Cultures of India’s Northeast: Naga Writings in English (2015). He has a PhD from Jawaharlal Nehru University, New Delhi. His area of interest includes Writings in English from the Northeast, Oral Tradition, Cultural Studies, Modernist and Post-colonial literature.